Forget demanding clients and scary colleagues, there is really nothing more intimidating than a room full of mothers.Mine, for a start, is a formidable force to reckon with. If you have a problem, she definitely has the solution. But when I embraced motherhood, I discovered the mighty powerhouse of mothering womankind that was Mumsnet. Who cares if my mother has reared three fine specimens of humankind (yours truly included)? I turned to this fiesty forum on whether belching infrequently would damage baby's gut lining irrevocably, if formula feeding would destroy baby's immune system permanently and whether the right angled arch stretch meant I needed to rush to hospital. So, imagine my terror and awe at being invited to speak at the Mumsnet Blogfest. The topic - Food Blogging: Where's the Beef? It's been eight long and wonderful years of blogging after all. During which I've gone from tormenting my mother to regretting it gravely. Revenge is best served with sweeties, fed covertly to your kids. It didn't take long for the conference panel debate to go from how it all started with that back of a fag packet idea, and the 11 rejections before the book deal to how I navigate the murky waters of brand partnerships (read: paid content). This for me is particularly sensitive. I guard this site jealously. I don't advertise here. Or offer guest posts. But on rare occasions, I do consider the odd brand partnership where the outcome could be relevant and interesting to you lovely people. Patak's is a case in point. While their jars of sauces reminds me of my early days in the kitchen, the pastes I was sent to trial were more of a revelation for the Chicken Shashlik & Malabar Prawn Curry. The trick to using these is to look closely at the ingredient labels for recipe inspiration, and to add a host of fresh vegetables and herbs to increase the goodness quotient in the end result. I have two Patak Curry Paste recipes. The jar of Rogan Josh paste I used as a marinade for Chicken Shashlik, a juicy, grilled chicken and vegetable kebab, with roots in Mughal days basted generously with a melted lemon butter. The mild curry paste was ideal for a Malabar Prawn Curry, steeped in tomato, curry leaves and whole mustard seeds and cumin seeds. Both made excellent, quick and very lavish weekday meals for the lot of us. I'm not about to say: "when I was a little girl". But sometimes life really does come full circle. I'll take two jars and a night off, thanks. Dice the thighs into large bite sized chunks and marinade in the Rojan Josh spice paste, ginger and garlic for at least an hour, more if you have the time. If you are using bamboo skewers, now is the time to soak them in water. Next, chop the onion and deseeded pepper into large pieces, and slice the courgette into 1cm thick slices. Toss them up in a bowl with the juice of half a lemon and salt added to your taste. Now turn the grill onto 200 degrees centigrade (400 Fahrenheit) and get on with the assembly job. Thread the vegetables and chicken cubes onto the skewers, packing them together so the chicken enjoys the moist goodness of the vegetables as they cook. I did onion, pepper, two chunks of chicken and onwards. If you keep a systen to the threading, the shashliks will look all the prettier when they are done. Then layer the skewers on a lined baking sheet and grill for 25 minutes, turning carefully a couple of times. Mix the remaining lemon juice with melted butter and use this to baste the chicken when you turn the skewers. This is lovely served with a squirt of fresh lemon juice and buttered rice. But it could easily be a very healthy weekday dinner, served with a leafy salad. 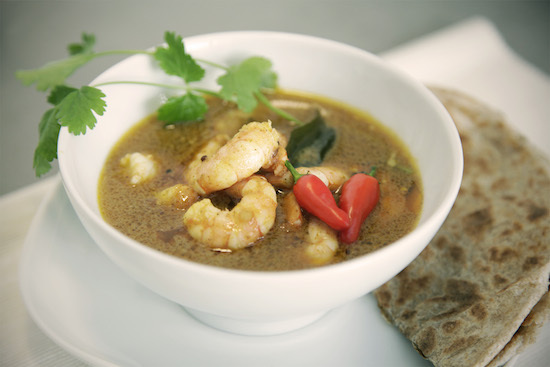 Toss the prawns in half a teaspoon of salt, the chilli and turmeric powders and leave to sit. Chop the tomato into small pieces. In a wok or kadai, bring the oil to heat on high. When it’s hot, toss in the cumin and mustard seeds, as well as the curry leaves. As they sizzle up, toss in the ginger and garlic for a few seconds and when they turn golden, the tomato pieces and the mild curry paste. Saute this masala on medium for two minutes and as the tomatoes disintegrate, stir in the coconut milk. If the masala starts getting stuck on the bottom of the wok, then add a tablespoon of warm water to loosen it. Let the coconut milk gently bubble for about 10 minutes, stirring regularly. Finally, drop in the prawns, simmering gently for another two minutes until they are cooked through. Add salt to taste and serve with a roti (or two). I love prawns and this looks so yummy. Thanks so much for posting the recipe. I really would love to try it out. I hope it comes out perfect. Would be great if it did. Fingers crossed for it. Hi Anusia, please do try it!